In her TEDx talk, she discusses how easy it is for an insider to decide to participate in an organizations and how many decisions an outsider has to navigate before deciding there is meaning for them on the other side of the literal and metaphoric front door. She uses the door metaphor a lot throughout her talk. She says that often organizations think that being more inclusive means opening existing doors wider, but what is necessary is to create entirely new doors to access organizational programs. In the case of her Museum of Art and History in Santa Cruz, this has meant things like having part of their surfing exhibition on the beach. Perhaps the most extreme and literal example of opening new doors she mentioned was that of the State Library of Queensland which built a gorgeous new white building and then invited aboriginal elders in to help them design an indigenous knowledge center. The elders noted that for them, knowledge wasn’t shared through books, but rather through music, dance and storytelling in a setting that wasn’t so sterile looking, most importantly around a fire. The librarians, true to their intent renovated a space for music, dance and storytelling and infused it with color. And they built a firepit (away from the flammable archives, of course). In her Minnesota History Center talk she suggested that not everything an organization does is for everyone. In her TEDx talk, she returns to that theme by noting that not everything you do in the process of opening new doors is going to please everyone. Your organization is no longer going to conform to the idea of what people think a theater, museum, opera company, orchestra, etc should look like. 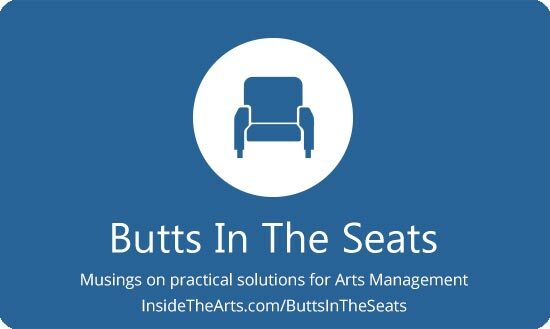 There is an important subtext here that distinguishes this line of thinking from historical conversations the arts have about connecting with audiences. She never suggests that the people entering these additional doors will one day enter the traditional doors. Typically, conversations about engaging new audiences are focused on getting people in the door with an eye to getting them hooked on the core programming of the organization. It may happen, but Nina never suggests that will happen. If it is the case that not every door/program is meant for everyone, some people may never/infrequently choose to enter the original doors/engage with the core programs. The end goal is to grow the relevance of the organization to a place where traffic through the new doors causes an identity to evolve which blends with or even subsumes what is currently considered the core program. Does Your Experience Need Speed Bumps? That’s a good TedX talk. Incidentally, I’m the stodgy traditionalist quoted at 6:28 in the talk. You are literally the person quoted or figuratively? Either way, from your past comments here you aren’t as stodgy as you suggest! Literally. It was in a comment on https://santacruzmah.org/2013/mending-hearts-with-pop-up-museum-on-f-my-ex, but I can’t point to it, as all the comments on that post seem to have gone away. Does Disqus discard comments after a while, or did MAH discard the comments in a website cleanup? Who knows? The comment was made at Feb. 20, 2013, 3:29 a.m.